David A. Bednar, a member of the Quorum of the Twelve Apostles of The Church of Jesus Christ of Latter-day Saints spoke to young adults from around the area Sunday evening. Elder David A. Bednar, a member of the Quorum of the Twelve Apostles of The Church of Jesus Christ of Latter-day Saints, visited Utah State University with his wife Susan and spoke a packed USU Spectrum building Sunday evening. 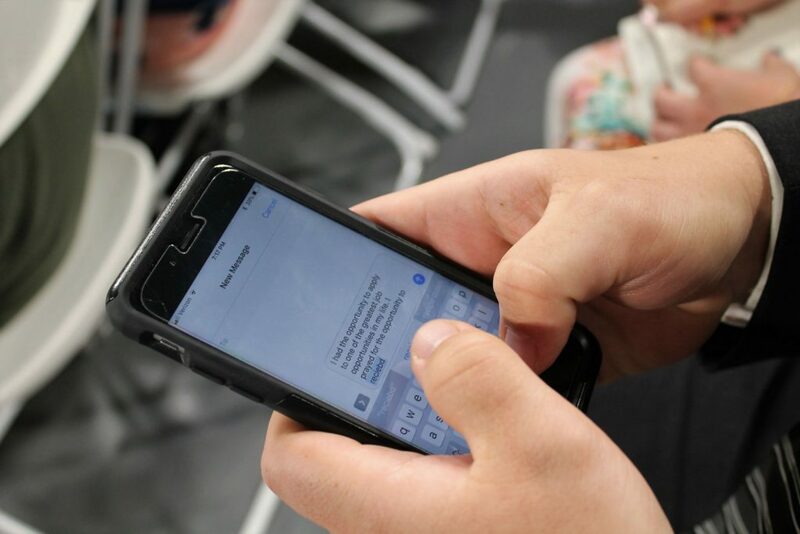 An audience member texts a question to Elder David A. Bednar Sunday evening in the USU Spectrum. 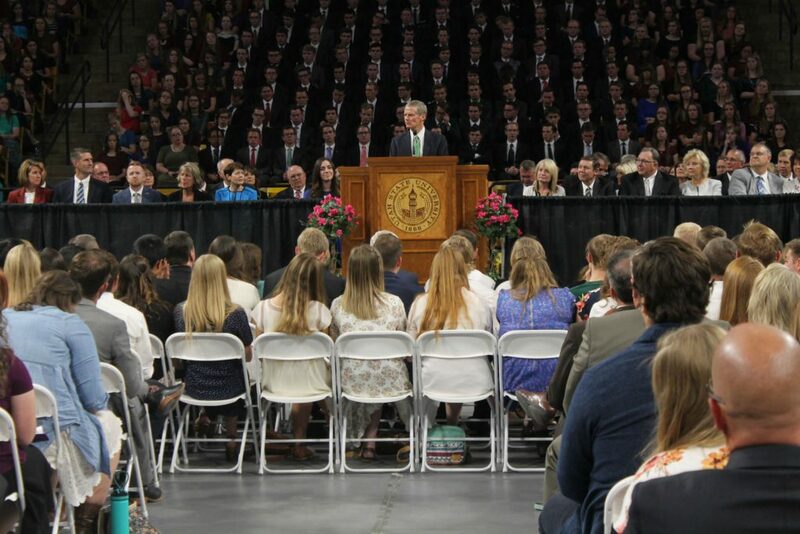 Young people came from all over Cache Valley, Box Elder and Weber counties to hear Elder Bednar’s remarks. In the usual Elder Bednar approach in large gatherings, he opened the meeting up to a question-and-answer session. He gave everyone a phone number to send text messages to, inviting the thousands in attendance to ask questions. As they texted their questions in, Elder Bednar instantaneously brought them up on his tablet, read the question then he and his wife would answer them. The questions for the most part were about courtship and marriage. When the former professor of business management at Texas Tech University and University of Arkansas felt like his wife had a particular view on a question he asked her to respond. He talked about meeting President Gordon B. Hinckley while Elder Bednar served as President of then Ricks College. They were sitting at a table together and Hinckley patted his hand and told him several times that we are living in the best of times. 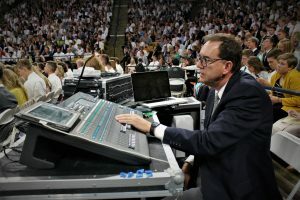 John Carter a sound engineer controls the sound so the entire audience can hear what Elder Bednar had to say. The Church never had such a positive reputation in the world, he said. Elder Bednar told the faithful that despite what people around them are saying or what they are hearing, they are living in exciting times. 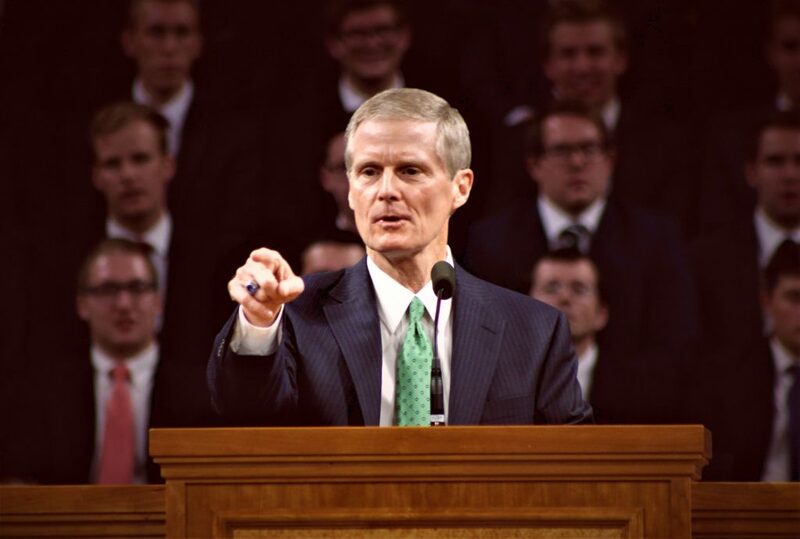 Prior to his call to the Quorum of the Twelve, Elder Bednar served as an Area Seventy, Area Authority Seventy, Regional Representative, twice as a stake president, and as a bishop. 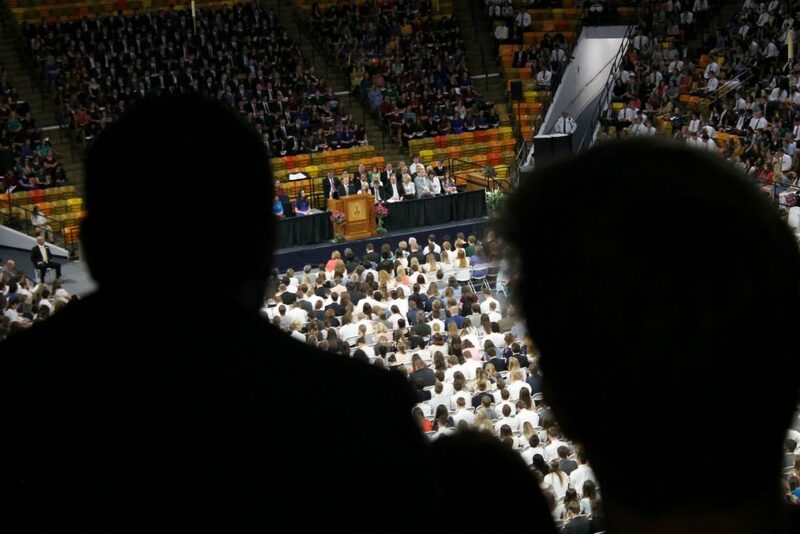 The Spectrum was packed Sunday evening with young adults from the Church of Jesus Christ of Latter-Day Saints. Elder David A.Bednar spoke to the group. 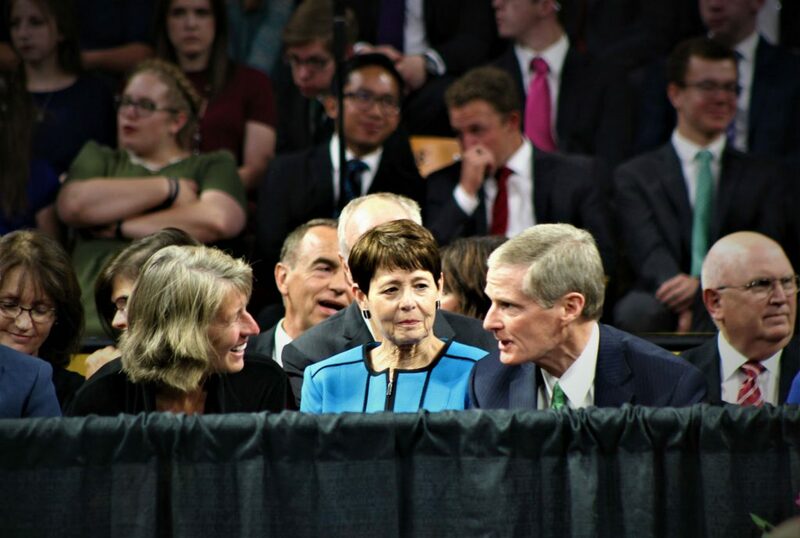 Noelle E. Cockett Utah State University’president speaks with Elder David A. Bednar, a member of the Quorum of the Twelve Apostles of the Church of Jesus Christ of Latter-day Saints Sunday evening. David A. Bednar a member of the Quorum of the Twelve Apostles of The Church of Jesus Christ of Latter-day Saints answers question Sunday evening at the USU Spectrum. David A. Bednar of the Quorum of the Twelve Apostles of The Church of Jesus Christ of Latter-day Saints asks an audience member where they went on their mission.